Brian MacKenzie received his law degree from the University of La Verne College of Law in 2010. He moved to the beautiful Pacific Northwest from sunny Southern California in late 2011 and has been a practicing attorney in Washington since 2012. He has had experience working in a variety of areas of law since that time, ranging from employment law to bankruptcy. 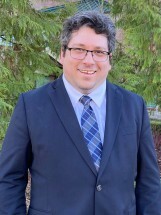 Brian joined Sam B. Gunn Law Firm PLLC as an associate attorney in 2014 and became partner with Gunn MacKenzie PLLC in 2019. He currently practices in the areas of Estate Planning, Probate, Guardianship, and Elder Law. He is a member of the National Academy of Elder Law Attorneys (NAELA) and its Washington Chapter (WAELA). He also serves on the Board of Directors of Lifeline Connections, and has volunteered with the Clark County Volunteer Lawyers Program and the Luepke Senior Center assisting with Elder Law matters. He is married to his wonderful wife, Gentry, and they live in Vancouver with their faithful dog, Jenny. In his free time he enjoys exploring the surrounding Vancouver/Portland environs, food trucks, traveling, reading, music, volunteering with his church, and all things Batman.